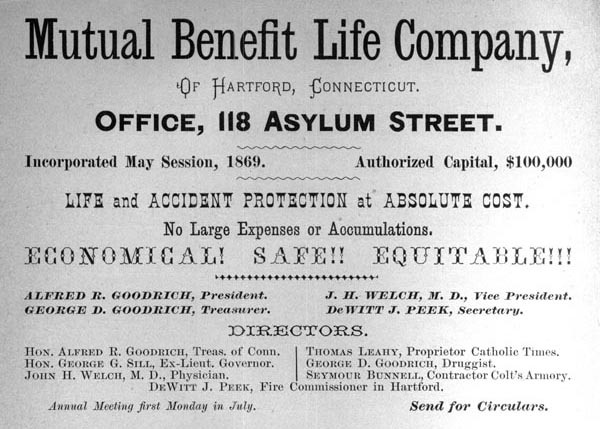 Mutual Benefit Life Company, of Hartford, Connecticut. Office, 118 Asylum Street. Incorporated May Session, 1869. Authorized Capital, $100,000. Life and Accident Protection at Absolute Cost. No Large Expenses or Accumulations. Alfred R. Goodrich, President. George D. Goodrich, Treasurer. J. W. Welch, M.D., Vice President. DeWitt J. Peek, Secretary. Hon. Alfred R. Goodrich, Treas. of Conn.
Hon. George G. Sill, Ex-Liuet. Governor. John H. Welch, M.D., Physician. Thomas Leahy, Proprietor Catholic Times. Seymour Bunnell, Contractor Colt's Armory. DeWitt J. Peek, Fire Commissioner in Hartford.